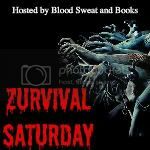 The Rules Of Zombieland- Omg I love Columbus's list of rules for surviving Zombieland they are so funny and clever. My Favorite rule is #22 When in doubt Know your way out, I think that's a good rule to live by Zombies or not. For a full list of Columbus's rules Click Here. Woody Harrelson- Tallahassee is by far my favorite character in Zombieland. Tallahassee is fearless but also a big ole softie underneath his gruff exterior. Woody Harrelson brought so much depth to a role that could've turned into one long redneck joke if played by someone else. Bill Murray- His cameo was so unexpected but welcome. I loved that he had found a way to play Golf eve in the midst of a zombie apocalypse, I could see him in real life doing that as well. His comedic timing also was perfect and he played so well against Woody Harrelson and Emma Stone. The Zombies- Since this movie is a zombedy the zombies easily could of been more funny then scary and surprisingly they stayed pretty true to form. 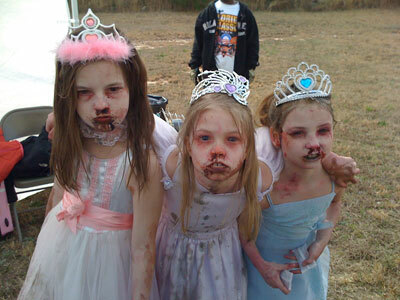 My Favorite Zombies were the little princesses who jumped on the SUV. Zombie Kill of the week- I loved how the movie stopped and had these, so funny. This was something I think made Zombieland stand apart from other films in the same category. Abigail Breslin- It's not like she was bad in this film it's just she wasn't really good. I didn't believe she was a girl who survived hell living through a Zombie apocalypse she seemed like she was acting which she was duh but we shouldn't be able to tell. I also really dislike that smack thing she does with her tongue when she talks really grates on my nerves. The romance- I could of watched the whole movie without the forced pairing of Columbus and Wichita. I think flirting is fine but seriously how could you fall for a girl who robbed you at gunpoint not once but twice?!? The Zombies- Yeah,Yeah I know I said I liked them and I do, it is just for a movie about zombies they weren't that prevalent. Also how the heck could the zombies sniff out a guy in the toilet but not Bill Murray in makeup. Just screams plot hole. Pacific Playland- Seriously do I even have to explain this? Sigh, guess so. Why the hell would someone go to an amusement park during a zombie apocalypse. Zombies aside, what happens if a ride breaks down with you on it? What about the fact that many rides cannot stop without someone manning the controls. I mean I get it the little girl was happy there but it's highly stupid to actually go. Zombie Clowns- Speaking of Pacific Playland, due to them going we have a glimpse of one of the most terrifying, unholy things in existence. I generally don't get scared but I had nightmares after seeing this zombified clown *shudder*. They will be the first zombies to go if a zombie apocalypse ever happened. Overall I did like Zombieland, I even have the poster above hanging in my living room. I just think that some of the obvious plot holes, and of course Abigail Breslin's acting put a damper on things. Would I recommend this movie? Hell Yeah, it is a good zombedy and deserves the recognition as such, it just could of been better. I give the movie a firm ★★★★. Now for this weeks questions. Have you seen Zombieland? What did you like about it? Why? Zombie clowns scary or not? Leave your answer in the comments below. I love reading your responses. I promise I wasn't inside your head, I was the shadow looking over your shoulder though muahaha j/k. That was you?? Haha! As I sit here watching I am Legend, all I can think is 'if the zombies ever hit, please let them be like the Shaun of The Dead zombies. These Legend ones are way too fast and smart. They are like the superheros of the reanimated dead. Yikes! Yeah I dont need smart zombies who can climb walls and such. No thank you.